WASHINGTON (CNN) -- The United States fears recent weapons purchases by Venezuela could fuel an arms race in South America, Secretary of State Hillary Clinton said Tuesday. 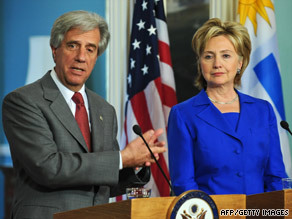 Uruguayan President Tabare Vazquez met and Secretary of State Hillary Clinton in Washington on Tuesday. "They outpace all other countries in South America and certainly raise the question as to whether there is going to be an arms race in the region," Clinton said about Venezuela's arms deals, after a meeting with Uruguayan President Tabare Vazquez. The Russian government Monday extended $2.2 billion in credit to Venezuela to finance arms purchases, including 92 Soviet-era T-72 tanks and short-range missiles with a reach of 55 miles (90 kilometers). Venezuelan President Hugo Chavez also said his nation will purchase an anti-aircraft weapons system with a range of 185 miles (300 kilometers). The planned arms purchases come at a time when Venezuela is at odds with neighboring Colombia over negotiations that would give U.S. troops access to Colombian military bases. Chavez has said his military buildup is in response to the growing U.S. presence in the region, which he calls threatening and dangerous to Latin America. The United States is also concerned about deepening ties between Venezuela and Iran. In addition to ongoing military cooperation, Chavez said in Tehran last week that the Iranian government would help Venezuela develop nuclear technology. In exchange, Venezuela has offered to export gasoline to Iran, which would give Tehran an out if Western nations impose petroleum sanctions over Iran's nuclear program. Senior administration officials say Venezuela's attempt at "sanctions busting" is alarming. Clinton urged Venezuela to be transparent about its weapons purchases. Venezuela, she said, "should be putting in place in procedures and practices to ensure that the weapons they buy are not diverted to insurgent groups or illegal organizations like drug trafficking gangs and other criminal cartels." Vazquez voiced concern that an arms race in South America would divert funds from badly needed development in poor countries. "We should devote our energies and resources to fight against the real scourges of our societies ... such as drug trafficking and terrorism," he said. "Instead of spending it in weapons, spending it in housing, good housing for our people, and to further deepen investment, especially in the field of education."